The NRL State of Origin is one of the most fiercely fought and popular sporting events in the country. It is of special significance to New South Wales and Queensland people because these are the 2 states that play for bragging rights in this best of 3 match series. These NRL rugby matches are played on Wednesday nights during the middle of the NRL premiership season and there is a real grudge held between the participants and fans of the two states. 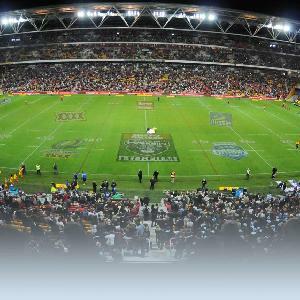 Due to the fact that the NRL State of Origin is so popular and many people travel from interstate to see the spectacle then you will find that all of the hotels, motels and serviced apartments in Brisbane will book up well in advance.o make sure that you book your NRL State of Origin accommodation early. The best way to get to Suncorp Stadium is to catch public transport to the event. You can either catch a bus and get off at any one of the stops surrounding the stadium or catch a train and get off at the Milton or Roma Street train stations and then walk the short distance to the ground. You can drive your own car into the match but be aware that there is limited parking around the stadium and there are also parking restrictions that are enforced. With a selection of 1 & 2 bedroom self contained serviced apartments that have spectacular views over the city and are situated close to the Brisbane CBD the Park Regis North Quay Apartments is the ideal accommodation for the NRL state of origin. The property is perched above the Brisbane River and is just a short walk to the Suncorp Stadium, Brisbane CBD, shopping and dining precincts. One of the best things about staying at the Central Cosmo Apartments is that you are surrounded by a plethora of restaurants, cafes, bars and entertainment options. This affordable apartment accommodation in perfectly positioned on trendy Park Road in Milton, just minutes from Suncorp Stadium, the Brisbane CBD, boutique shopping and many other things that Brisbane has to offer. The Sedgebrook on Leichhardt gives travellers to Brisbane the choice of studio, 1 & 2 bedroom self contained serviced apartments that are known for being great value accommodation. Located in the precinct of Spring Hill and close to the Brisbane CBD the Sedgebrook on Leichhardt is within easy walking distance to cafes, restaurants, the Queen Street Mall, Suncorp Stadium, Roma Street Parklands, China Town and Southbank Parklands. The iStay River City has affordable self contained apartments overlooking the Brisbane River, the Botanical gardens and the CBD. The River City Apartments provides convenient Brisbane city accommodation, with easy access to bars, restaurants, the Queen Street Mall, the Roma Street Transit Centre, South Bank, Suncorp Stadium, shops and theatres. Business and leisure travellers to Brisbane will appreciate the convenient location in the heart of the Brisbane CBD that the Evolution Apartments offers. With spectacular river and city views, unparalleled recreational facilities and luxurious apartments the Evolution Apartments is well placed just a short distance from the Brisbane Tranist Centre, Suncorp Stadium, Queen St Mall, Southbank Parklands and the Queensland Performing Arts Centre.